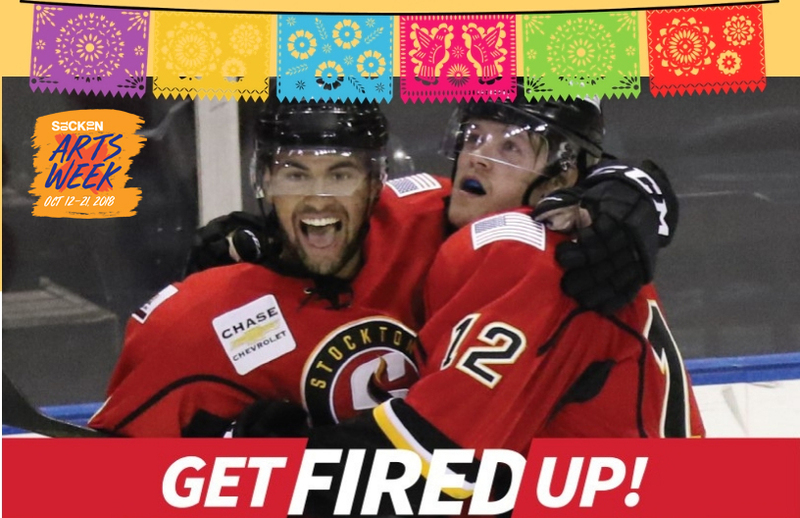 The San Joaquin County Hispanic Chamber of Commerce and the Stockton Heat Hockey Team have partnered to host the Latino Heritage Day on Saturday, October 13th at 6PM to celebrate Stockton Arts Week! Arrive early for youth sports post-game soccer on the ice and the Hispanic Chamber of Commerce's ceremonial puck drop. Fans will also enjoy in-game host announcing the action in Spanish, along with Coco the Movie clips during game showings. This fiesta will include a special appearance by Ballet Folklorico Janitzio de Vivian Resendiz and Franklin High School, and will feature authentic Mexican cuisine inside the arena! Receive a FREE HEAT HAT with each ticket purchased! Single game ticket prices vary. Check the rates here! Season Memberships, Flex-Packs, and group tickets are available. Get info here! Call 209-373-1500 to learn more about your ticket options! Don't miss the rest of the Stockton Heat 2018-2019 season running October 2018 through April 2019!